Just three matches were possible as the rain and snow returned to decimate another Saturday programme in the North Riding Football League. The only NRFL Premier Division clash saw St Marys 1947 jump up to fourth spot after defeating Grangetown Boys Club, who remain in dire trouble, 8-3. The match was switched to Yarm in midweek and St Marys perhaps profited as they raced into a 3-0 lead inside 14 minutes. Chris Norlund fired them in front on just four minutes, with Chris Peacock soon doubling their advantage. The Saints had three when Scott Close fired home. Ryan MacKey made it four, ten minutes before the interval. Two goals in four minutes, early in the second half, put the result beyond doubt as Paul Vaughan and Ben Cotts netted. Mark Ward pulled one back for Grangetown, with Anthony Barnes quickly making it 6-2. Cotts then answered with two in two minutes himself, to complete a hat-trick, before Ward completed the scoring, five minutes from time. 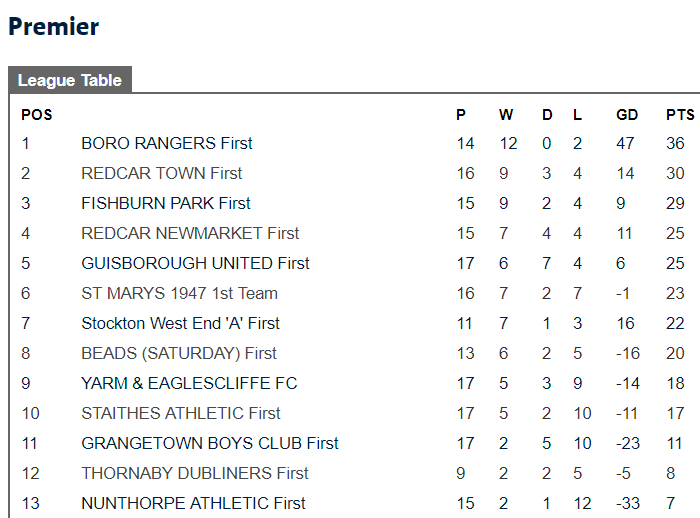 Half the line-up for the Lou Moore Trophy semi-finals were confirmed as the top tier's form sides Boro Rangers and Stockton West End both progressed. League leaders Rangers defeated title rivals Fishburn Park 5-1. A one-sided encounter saw Matt McQueeney, Jamie Bellamy, Paul Blake, as well as Rob and Tom Keenan, find the net. The third-placed Whitby side replied through Jake Faichney. West End also hit five at the expense of Yarm and Eaglescliffe. Ben Turner fired a four-goal salvo, with Carl Williams also on target for the Stockton outfit. Their visitors responded through Calum Stevens and Dom Wilson. Thanks to Andrew Snaith, NRFL Media Officer.